The New South Wales (NSW) government in Australia has recently released (February 2019) a new guideline entitled ‘Everyone Can Play’. 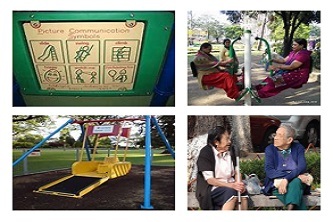 The guideline is not a new standard but a best practice toolkit which will provide valuable information to everyone involved in the planning, design, delivery and management of inclusive play spaces in Australia but may also be useful for reference purposes in Ireland and many other parts of the world. The guideline recognises that play is an important part of a child’s development and creating play spaces that are inclusively designed will enable everyone, regardless of their age and ability, to use these spaces. It is worth noting that the guide is strongly influenced by the principles of Universal Design and the current theory and research into play space design, accessibility standards and universal design were reviewed during the process. The guidelines will be beneficial for children, young people, adults and their communities along with the professionals involved in the design process. The guidelines also provide a useful checklist which will enable people to review new and existing play space designs. To view the Everyone Can Play Guideline in full, please click here.